Happy New Year & Hello, 2017! What are your resolutions for the new year? Do you make them? I don’t usually… but this year, I feel like I need a reset. I know it’s totally cliché, but I am starting the new year off with healthy goals in mind. I want need to eat better and get back to exercising. Lately, I am far too dependent on sugar & carbs for quick fixes to get me through the day. Most days when I sit down to dinner, I realize it’s the first actual meal I am having that day. What?! That ain’t right! ???? Not only am I doing myself a disservice, I’m doing my kids one too. If I’m not being a great example for healthy eating, how can I expect them to eat healthily? Aside from that, when I’m hungry, I’m short tempered. A short temper around toddlers is like locking a raccoon in your garage, it isn’t going to end well! SO… my goal for a better me is 30 min of exercise at least 3 days a week & one healthy smoothie every morning. Smoothies are fun and versatile. I can throw in whatever fruit & veggies I have on hand, add in some sneaky tid-bits for extra nutrition, and in just a few seconds I have a beautiful little concoction of goodness. Usually my girls will share it with me, so we’re all reaping the benefits. Below is one of my all-time favorite combos. With a gorgeous deep purple color, it is just plain fun to drink. I am always a bit bummed when it’s gone! 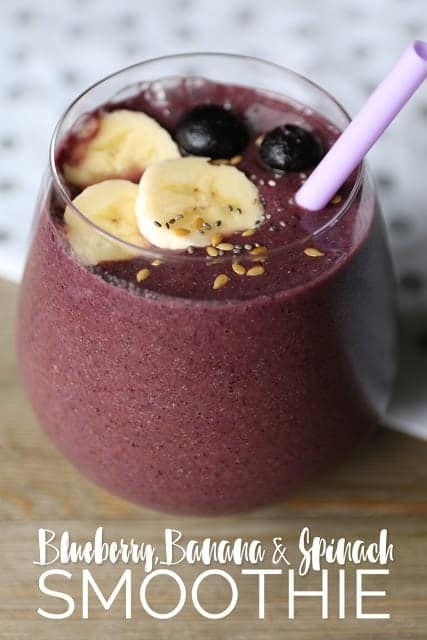 Rich in antioxidants, fiber & nutrients this smoothie is not only delicious but packs a healthy punch! Place all ingredients into high powered blender jar. Blend on high until very smooth. Enjoy immediately!